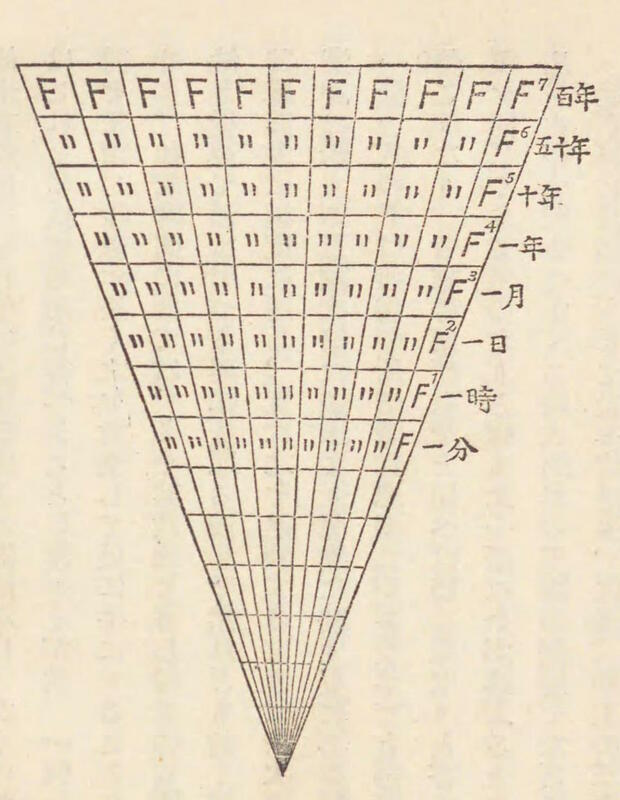 In Japan, the impulse to reason about literature with numbers is at least as old as Natsume Sōseki’s Theory of Literature (1907). 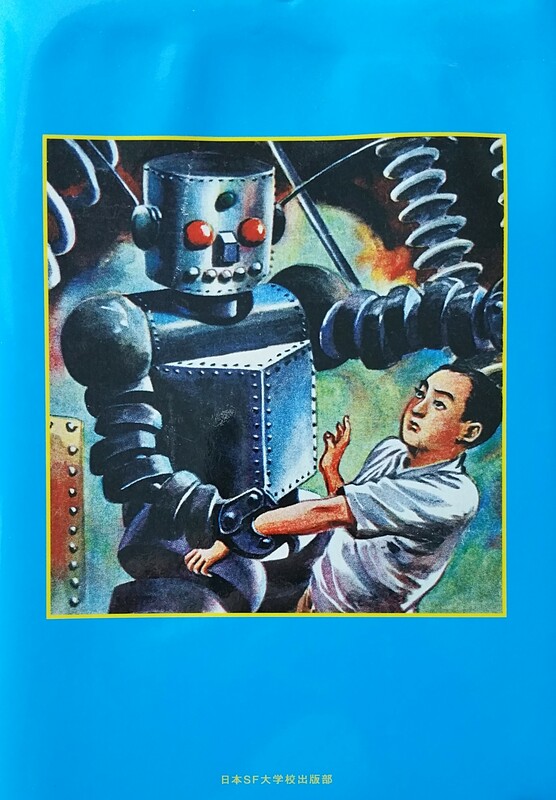 Most recently, computational methods and the availability of digital corpora have channeled this impulse toward new ways of engaging with Japanese literary history. 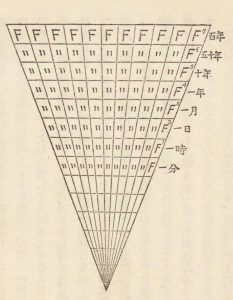 In this essay I consider the relation of Japan’s quantitative pasts with its quantitative futures by tracing a genealogy of quantitative reasoning that begins with Sōseki’s attempts to read literature physiologically, moves through early stylistic and psycholinguistic analyses of the 1930s and 1950s, and ends with the linguistic turn of the 1980s. I use this genealogy to reflect on when it has seemed necessary to reason about literature with numbers; on the ways that the methodological infrastructure for this reasoning was built and borrowed; and on what this history can tell us at a time when numbers seem necessary and useful once again. 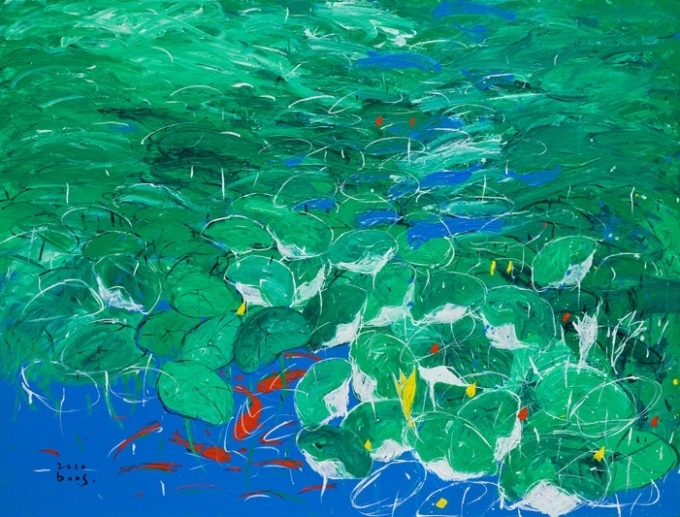 Cho Boo-soo, 수련 (Water lily), 116.8×91cm, Acrylic on Canvas, 2010. 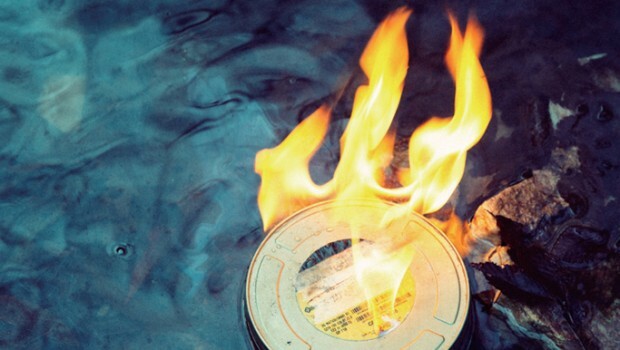 This chapter analyzes a Korean-Chinese filmmaker, Zhang Lu’s films and their South Korean reception. As a third-generation member of the Korean diaspora in China, Zhang Lu has self-consciously captured in films what he aptly terms “the scenery of strangers,” transcending nationally-defined issues and depicting those lives pushed to the peripheries and boundaries between nation-states, by featuring ethnic Koreans across China, Korea, and Mongolia. However, since 2012, when Zhang Lu temporarily shifted his main base for filmmaking to South Korea, issues related to Korean diaspora did not surface explicitly in any of his recent films, such as Gyeongju (2014), Love and… (2015), and A Quiet Dream (2016). Far from viewing Zhang Lu’s “homecoming” as a fait accompli, I argue that his recent work reveals another journey taken, in the very act of homecoming, by this film director with a hyphenated identity. His return to Korea involves another departure for him, which initiates long overdue conversations on collective memory with its homeland audience. By examining Zhang Lu’s cinematic rendition of his history of displacement and envisioning of an intersubjective cinematic experience, this paper explores not just collective memories of the past in the homeland and sites of diaspora, but also a new sense of communication and community-building between historically and spatially divided lands and nations. This talk revisits South Korean journalist and scholar Ri Yŏng-hŭi’s (1929-2010) writings on China in the 1970s in an attempt to find a productive way to approach China’s socialist experience within the context of Korean intellectual history. 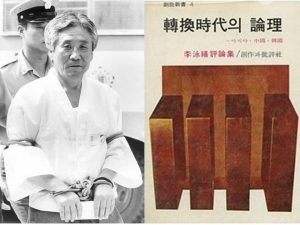 Ri’s lively and rigorous writings on contemporary China in the 1970s, which relentlessly challenged the mainstream anti-Communist views, had a profound impact on South Korea’s younger generation of the time. However, after witnessing the collapse of the Soviet Union in 1991, as well as the political and social changes that occurred in China after the 1980s, Ri admitted not only that his knowledge of contemporary Chinese affairs was far from complete, but also that his enthusiasm about Chinese socialism was mistakenly ideal. As I closely examine the details of Ri’s retreat in his position with regards to Chinese socialism and the significance of this retreat for South Korean intellectuals, I suggest that Ri’s retreat leads us to confront the fundamental dilemma embedded in the Cultural Revolution, that is, the complex relationship between enlightenment and collectivity. 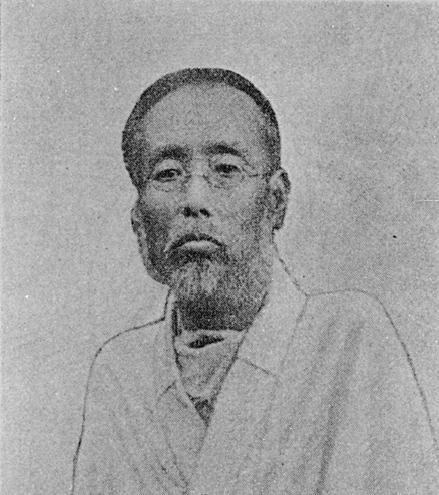 Based on Ri’s perception of the Cultural Revolution as “a revolution of humanity,” as well as his understanding of Chinese writer Lu Xun, I argue that Ri appreciated the coexistence of enlightenment and collectivity at some level during the Cultural Revolution, although he was not able to fully tease out the above-mentioned dilemma underlying this coexistence. Korean scholars of the present day need to contemplate the dilemma that Ri left unclarified as he retreated. Please note that there will be no pre-circulated paper for this meeting. As our final meeting of the year, the workshop will be followed by a reception with food and drinks. We look forward to your attendance! 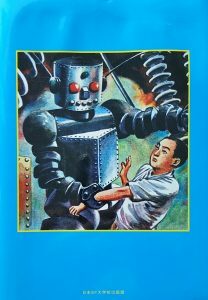 The dissertation project outlined in this proposal seeks to bring together three conceptual concerns – technology, race, and the body – through the mediating object of Japanese science fiction (SF) media across the 20th century. Looking at the three key historical moments of the 1920s-30s, 1960s, and 1990s-2000s, the project asks how the racialized body has persisted as a site of contestation, even as technological advancement and (post)modernity attempted to efface it as such. In part a continuation of recent attempts to read genre literature into Japanese media history, and in part an investigation of how East Asian area studies can add additional nuance to the conversation on race and SF already begun by Afrofuturist studies, the proposed dissertation lies precisely at the intersection of media studies and area studies. The paper is available at this link. If you do not have the password, or if you have concerns about accessibility, please contact Alex Murphy at murphya1@uchicago.edu. This Friday, in conjunction with the East Asia: Transregional Histories workshop and the Midwestern Japanese Studies Workshop, we are pleased to host Robert Tierney (Associate Professor of Japanese Literature, University of Illinois at Urbana-Champaign. Professor Tierney will be presenting a chapter draft from his current book project. The chapter is an exploration of the writing of Nakae Chōmin’s One Year and a Half and its sequel, composed in 1901 after Chōmin was diagnosed with terminal cancer. In the chapter, Professor Tierney explores the concept of “terminal time,” and how Chōmin both reacted to and learned to live with his death sentence as reflected in the two novels. This chapter explores the intersection of personal and collective memory in Wei Junyi’s (韦君宜1917-2002) understudied memoir, Recollections of Pain (Si tong lu思痛录, 1998). 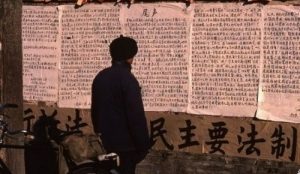 Written between 1976 and 1989, Wei’s text stands out in the sea of post-Mao memoirs that have tried to come to terms with the sufferings of the revolutionary era. The effort to critically reflect on the past, personal and collective, ensures Wei’s memoir a place in the large body of “literature of reflection” (fansi wenxue反思文学). The chapter engages with the “reflective” agenda of the text and asks how reflection operates, what its models are, and how it relates to the collective identity constructed in the text. I argue that self-criticism (jiantao 检讨)—the socialist practice of self-analysis meant to identify one’s mistakes and reform oneself—provides Wei Junyi with an important model to examine the past. The logic of self-criticism is summarized by the formula “unity-struggle-unity.” Wei’s memoir, in its entirety, re-enacts the formula. On trial is her and other people’s deviation from the original project of eliminating privileges and building a democracy. In the “self-criticism” Wei carries out the “self” is however not simply the individual self but a collective self. It is this collective identity that allows Wei to intertwine, in the memoir, the widely felt urgency to reflect on the past with contemporary debates on democracy. My study of the intersection of personal and collective identity in Recollections of Pain shows how collective narratives did not disappear immediately after the end of the revolutionary period. Moreover, reading Wei’s memoir from the perspective of how it recuperates and/or departs from the rhetoric and structure of jiantao allows a better understanding not only of the place of self-criticism within the broader context of cultural and literary practices, but also of its relation to the way literature was imagined, desired, and pursued. The paper is available directly below, or at this link. If you have not received the password, or have questions about accessibility, please feel free to contact Alex Murphy at murphya1@uchicago.edu.